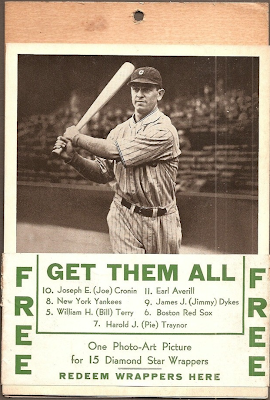 Great Depression or no Great Depression, one reason to get lost in that seminal decade is today's profile, the Diamond Stars baseball set made by National Chicle. Nothing but color-saturated, Art Deco glory packaged with gum for a penny each. Before we dive any deeper into how this particular set came to be, I'll note gum-and-card packs in general didn't just "happen" 80 years ago. They reflected a business-savvy combination of food technology, fan technology, and finance technology. 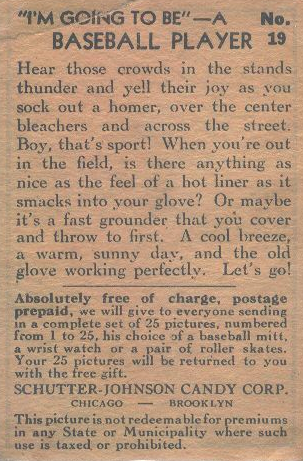 First, you needed gum and paper mixes that didn't destroy each other. Topps cards are infamous for picking up stains during packaging, but early commercial chewing gum (based on tree sap) stuck to anything and the plasticity of 1930s formulations lessened this impact. 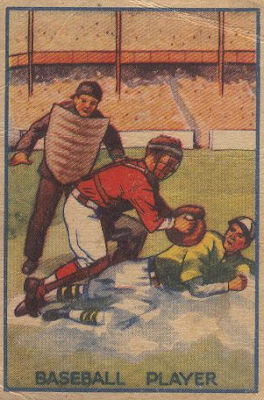 Second, the national growth of broadcast radio meant most fans didn't attend games in person, so baseball cards made an attractive visual companion. 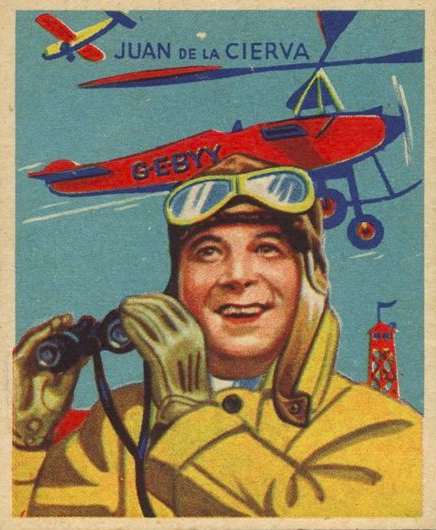 Finally, 1933 marked America's departure from the strict gold standard, freeing investment for new lines of business...like marketing cards with gum. 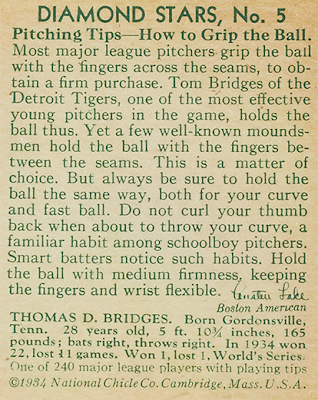 Returning to baseball, tobacco companies produced baseball's first generation of cards, roughly 1890 to 1910, but eventually abandoned them as marketing tools, given spiraling costs of paper and printing. I think their artistic apex was the Turkey Reds set of "cabinets," large pastoral images printed on cardboard stock (more info at T3TurkeyRed.com). It's a quality predecessor for Diamond Stars' painted look. 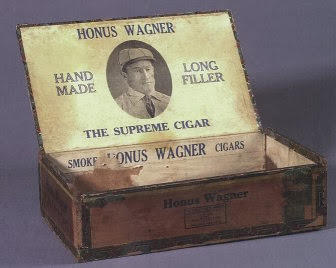 Once tobacco left this market, candy makers and strip cards took over for the next 20 years, churning out low-end baseball promos in an era that evolved from Dead Ball to Babe Ruth. Fast-and-loose production yielded cruder images, but also makes them affordable for modern collectors looking to buy a legend. The tail end of that candy era included two sets that either inspired or reflected card designs for the next decade. 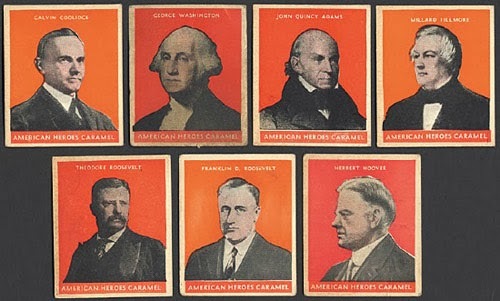 First, as candidates campaigned in 1932, the Boston-based U.S. Caramel Co. capitalized on stateside political fervor with a set of 31 "American Heroes" (the presidents), from George Washington to a newly-elected Franklin Delano Roosevelt. U.S. Caramel reused the Presidents size (2-3/8" by 2-7/8") and basic design for their "Famous Athletes," a 32-card set of baseball players (27), boxers (3), and golfers (2). These wider cards added some protection to malleable slabs of candy, the reverse of tobacco's need for slimmer cards that fit vertically in cigarette packs. 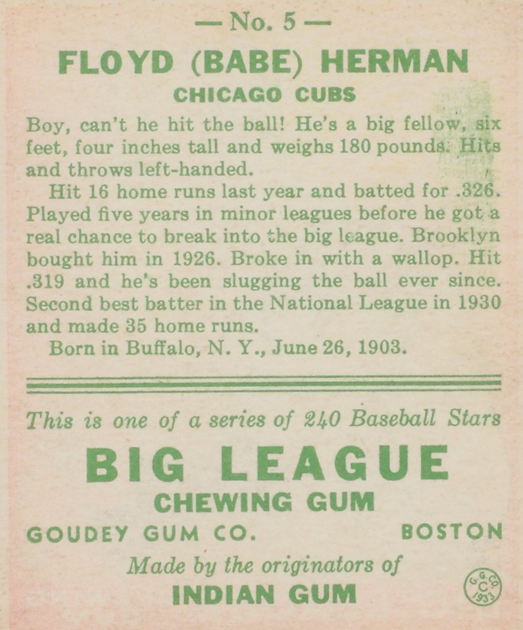 I've already profiled this Famous Athletes set, but it fits here because Boston-based trading card competitors Goudey and National Chicle adopted a similar card size, packaging, and back layout for their own gum sets, starting in 1933. U.S. Caramel, in turn, copped its back design (but on wider stock) from other candy makers, like this 1930 Schutter-Johnson Candy "I'm Going To Be" set of aspirational cards. 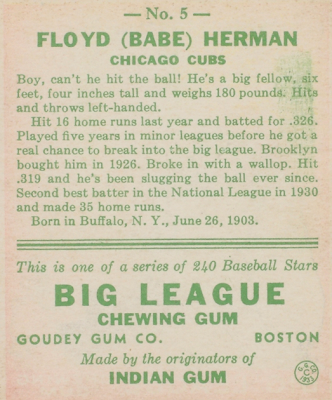 Diamond Stars Gum's text-heavy look debuted in 1934, but ensuing years added stat updates to some cards. 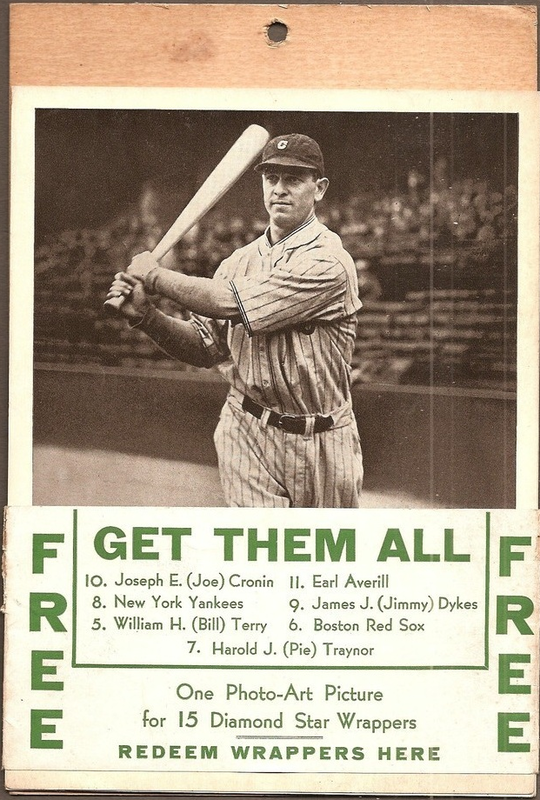 The "In 1934 won 22, lost 11 games" text on my #5 points to a 1935 release. Some printings, including this 1936 version, use blue ink. 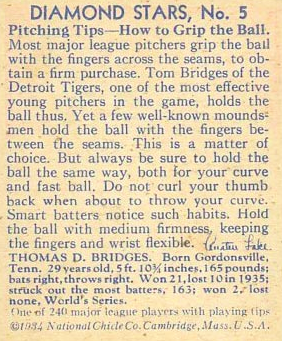 National Chicle advertised a target of "240 major league players," but stopped at just 108, probably thanks to The Great Depression and fading sales. 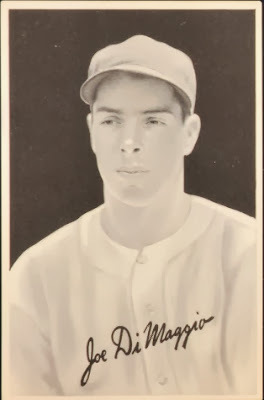 A master set of stat variations, green/blue ink backs, and error corrections ("Earnie" vs. "Ernie" and "Greenburg" vs. "Greenberg") from all three years totals 168 cards. Diamond Stars predecessor Skybirds Gum introduced National Chicle's Art Deco look and is one of the hobby's most appealing non-sports sets. 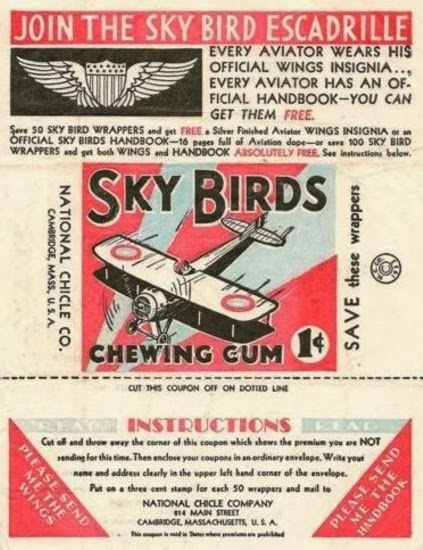 Its wrappers offered promotions similar to Diamond Stars, swapping wrappers for aviator wings and a flight handbook. 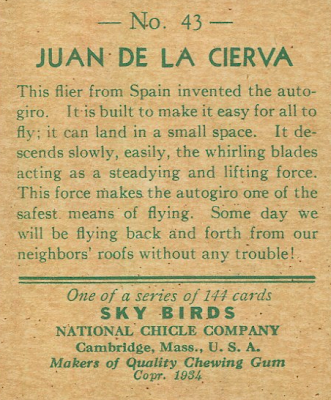 National Chicle packaged these postcard-sized "photographic art pictures" (collectors call them Premiums) with in-store promotional plaques encouraging gum buyers to make the swap. Premiums represented a two-fold marketing strategy. First, convince kids to spend at least 15 cents on Diamond Stars and keep their money in one brand. Second, bring kids back to the same store for repeated exchanges, so they felt invested in both the gum and its seller. Cataloged R311 and nicknamed "glossy" or "leather" depending on the photo gloss, 1934-36 Premiums remain plentiful on eBay today. 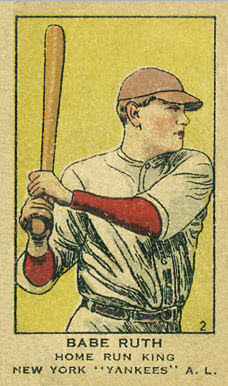 Goudey acquired the "Diamond Stars" name after National Chicle's bankruptcy in 1937. They produced two sets of Premiums under that brand, now cataloged as R303-A or -B, and a similar design for Canadian distribution via their World Wide Gum subsidiary. 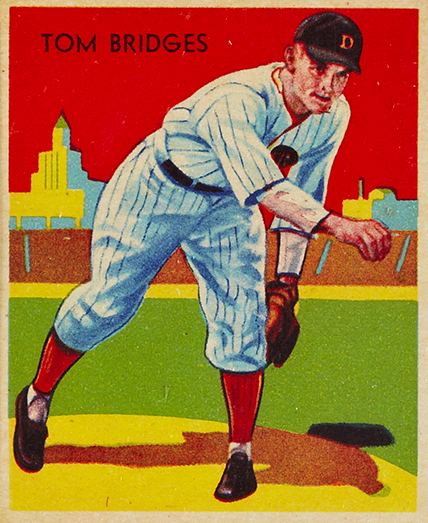 Collectors agree they're attractive pieces, if a bit pale in comparison to Chicle's cards of many colors. I hope this tells you more than you knew before about a great 1930s set. 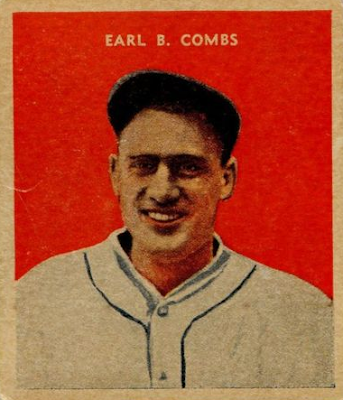 More about Goudey's Canadian operations in a future post! Value: I was lucky to receive today's #5 gratis from a collecting friend. Low-grade Diamond Star commons run about $10 on eBay, but stars and high numbers cost several times that. 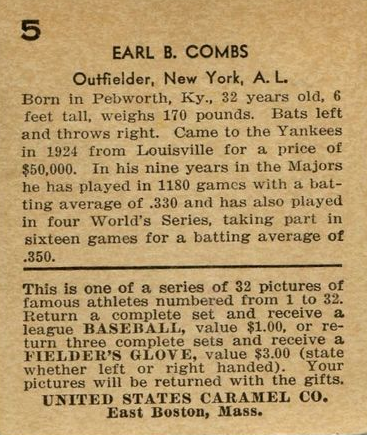 Fakes / reprints: Many reprint sets exist, and people have probably faked the stars, too. Several "modern retro" sets reproduced its hand-painted style with both vintage and active players. Wow. Great blog. 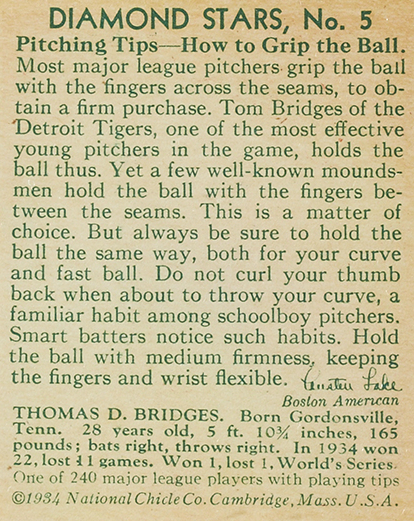 Love the insight to the older cards. Keep up the good work. Thanks, this was one of my favorites to dig into, given the way all those sets linked together. I suspect there was both a little "borrowing" and also some common people behind the designs. I'm truly enjoying your blog, Matt. Haven't seen you in years, wishing you all the best. I'll be following all your posts so keep up the excellent work. I see your #5 collection is getting massive!